RIO DE JANEIRO, BRAZIL – After hundreds of screenings of over three hundred films in more than thirty theaters throughout the city of Rio de Janeiro, the sixteenth edition of Festival do Rio, the Rio International Film Festival, drew to a close with the Première Brasil award ceremony on Wednesday, October 8th. The Première Brasil award ceremony took place on Wednesday, October 8th, the final day of Festival do Rio 2014, photo by Rogerio Resende/R2Foto, courtesy of Festival do Rio. “Salt of the Earth,” a documentary about photographer Sebastião Salgado opened the festival on September 24th and “Trash,” Stephen Daldry’s highly anticipated film adaptation of Andy Mulligan’s 2010 novel, made its the world premiere at Festival do Rio on Tuesday, October 7th. During the festival the Première Brasil section alone included sixty-nine feature and short films. A competitive section of the festival, Première Brasil awarded the Troféu Redentor (Redeemer Trophy) on the final night of the festival for the categories; Best Feature Film Fiction, Best Feature Documentary, Best Short Film, Best Direction of Fiction, Best Director of Documentary, Best Actor, Best Actress, Best Supporting Actress, Best Supporting Actor, Best Screenplay, Best Editing, Best Photography, Best Feature Film Fiction Popular Vote, Best Feature Documentary Popular Vote and Best Short Film Popular Vote. 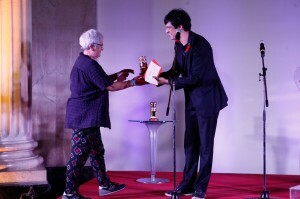 The “Felix Prize” award ceremony on October 6th, image courtesy of Festival do Rio. Lírio Ferreira’s “Sangue Azul,” was the biggest winner of the night, taking home the Troféu Redentor for Best Feature Film Fiction, Best Director and Best Supporting Actor for Romulo Braga. Matheus Fagundes won Best Actor for his work in the film “Ausência,” and Theresa Jessouroun’s “Á Queima Roupa,” won for Best Full Length Documentary. “The films awarded were chosen because they all have a strong personality and flirt between strong social commentary and poetic fables about the world we live in,” said Karim Ainouz, the chairman of the official jury, which also included Andrea Barata Ribeiro, Malu Mader, Maurizio Braucci and Mike Downey as judges. In addition to the juried awards, the audience voted during the festival and the winners of the Première Brasil popular vote included Fellipe Gamarano Barbosa’s “Casa Grande,” for Best Feature Film Fiction and Rodrigo Felha’s “Favela Gay,” for Best Full Length Documentary. Also for the first time, the “Felix Prize,” was awarded to gay and lesbian films. During a ceremony held on October 6th, Miriam Chnaiderman’s “De Gravata e Unha Vermelha,” won for Best Documentary; Panos H. Koutras’ “Xenia” won for Best Film Fiction and Sophie Hyde’s “52 Tuesdays” took home the jury prize. For those who may have missed the festival or are interested in viewing films they overlooked during the official schedule, the Estação Botafogo and Cine Arte UFF theaters will be screening several of the festival’s films from October 9th through the 15th.